The Christian churches have always looked for dogmas when reading the Bible, especially the Gospels and the Letters of St. Paul. This is an essential task, but sometimes in our eagerness to turn everything into dogma we miss some more immediate meanings and messages. The transfiguration of Christ is an excellent example. The Orthodox Church celebrates the “Transfiguration of our Lord, God and Savior Jesus Christ” as one of the great feasts of the church year. And it is indeed one of my own favorite days of the year, so rich with meaning and spiritual blessings. One of my greatest regrets is that in our local church on only a few years have we been able to observe this feast day with anything like the fullness of the liturgical wealth that is proper to it. On most years – including this year – we manage only with Liturgy; we’re not usually equipped to include a full Vespers and Matins. But that will change: there is a significant segment of our parish who desire a fuller experience of our Orthodox liturgical richness. Not only is Transfiguration one of the great feasts of the church, it is also the inspiration for an important doctrine in the patristic tradition that the Orthodox Church has inherited and safeguards: the doctrine of deification (theosis). It is a beautiful part of our theology. It gives hope to the struggling Christian – hope of personal transformation and hope of universal blessedness. It is also the inspiration for much of our ecological consciousness. It is not by accident that our spiritual leader Bartholomew has been called the “green Patriarch.” Long before any Catholic Pope addressed humanity’s destruction of the environment, Patriarch Bartholomew called it “sin“! He has worked tirelessly to raise the consciousness of anyone who will listen to the dangers of global warming. In Pope Francis he has found a strong ally in this struggle, and the Pope often refers to Patriarch Bartholomew’s work in his recent ground-breaking encyclical, Laudato si’. My article on this date last year, Life and Death on August 6th, touched a little on the theme of deification – in addition to the Hiroshima bombing (70 years ago today), which has become tragically and forever linked to this day. But are we missing an important part of the message of this event in the life of Jesus? It is wonderfully described in three of the four Gospels (the three that we call the Synoptic Gospels): Mark 9:2-10; Matthew 17:1-9; and Luke 9:28-36. All three Gospels quote Peter as saying to Jesus, “it is good for us to be here.” Peter offered to make three tents – τρεῖς σκηνάς – for Jesus, Moses and Elijah, so they could linger on the mountain. Mark and Luke comment that Peter didn’t know what he was saying. In other words, he was out of his mind to make such a suggestion! And Jesus indeed wanted nothing of Peter’s offer. As soon as Peter spoke, a cloud overshadowed them and the voice of God was heard saying, “This is my beloved son, listen to him!” And the vision came quickly to an end, and Jesus was alone again. It was a moment in time – a moment when the divine glory visibly and tangibly revealed itself to a few chosen humans. It wasn’t a matter of a few elite men being treated to something they could brag about. Quite the contrary, they were instructed to say nothing about this experience until after Jesus had risen from the dead. 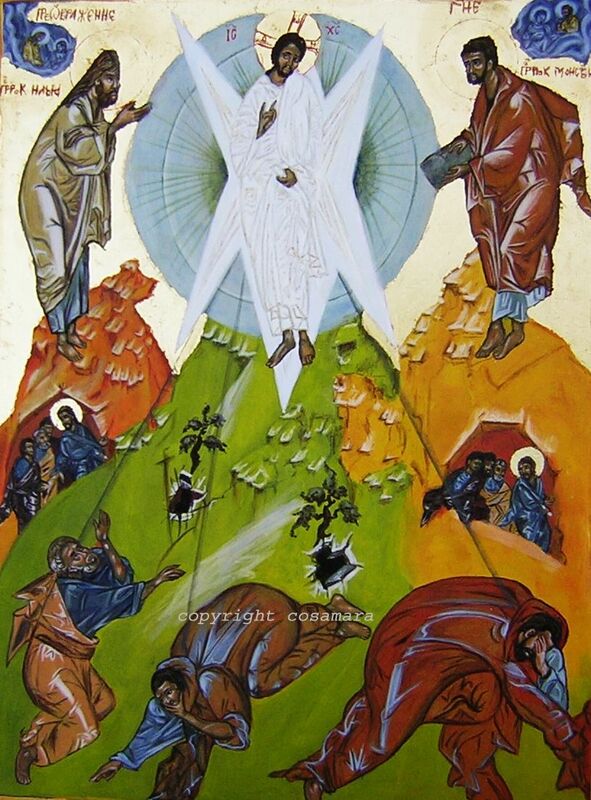 Real transfiguration does not take place on a mountain; no, not even on Mount Athos! Real transfiguration happens in the maelstrom of human life, in the chaos that often accompanies our actions. It was chaos that waited for Jesus and the three disciples who were with him when they came down from the mountain of transfiguration (most fully described in Mark 9:14-27). The nine disciples who had not gone up the mountain with Jesus had tried to heal an epileptic boy and were unable. Jesus enters the scene of confusion and hurt egos and does what human ego could not do. “Listen to him,” the voice from heaven told Peter, James and John on the mountain. He doesn’t need a tent, Peter! His body – his life among us – is a tent. John’s Gospel tells us that he ἐσκήνωσεν ἐν ἡμῖν – literally, “he pitched his tent among us.” Jesus is a nomad in the desert of our lives. He pitches his tent with us and sits with us under the starry skies to teach us calm and trust in the chaos of our lives. We don’t build him anything – no tent, no house, no temple – he is the tent, the temple, our home. He is our transfiguration! “Listen to him,” the voice says to us also. It is good for us to be here – here, in this world, in this life, in our daily existence. We don’t need to go on a mountain high to experience the glory of God. 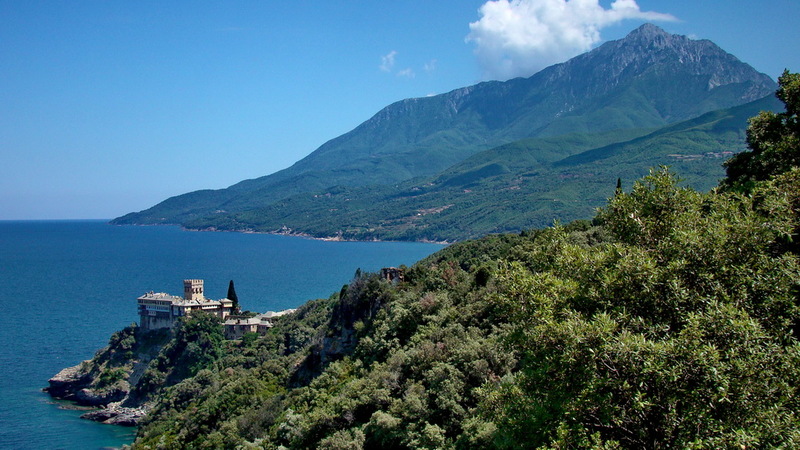 I’ve been on Mount Athos (so-called, “the Holy Mountain”) in northern Greece; twice. I met many holy men there (and many who were full of themselves). The one encounter that still lingers in my mind after 33 years is the conversation I had with the gate-keeper at Stavronikita Monastery in the summer of 1982: a tall, slender man of the most serene demeanor I have ever known, whose name I unfortunately now forget. We talked in the little room at the entrance of the monastery. We wondered at the beauty of the place and all the gifts of nature and spirit that God had provided for the monks’ existence. The monk and I could repeat the words of Peter, “it is good to be here.” And it was good, an extraordinary feeling of being at peace with oneself, with nature, and with God. But the holy monk ended our conversation with the calm assertion that all this can be taken away by the Panagia, at any moment. The monks believe that Panagia (the popular name for the Virgin Mary, the Theotokos) is the protectress of the Holy Mountain, so it is naturally her prerogative to remove her protection and allow it to be destroyed. 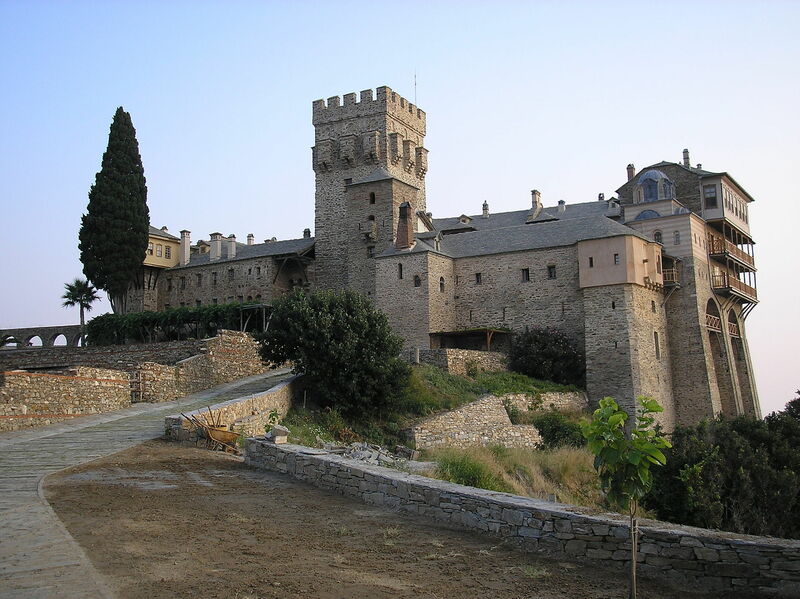 All this physical and historical treasure, all the spiritual wealth of Athos – it can all be taken away. And this venerable monk was totally at peace with that thought. It was the one moment in my life when I came closest to experiencing what Buddhists call ‘impermanence’. Nothing is permanent and we suffer the most when we try to cling on to something that is not meant to last or has come to its end. Categories: Biblical Explorations | Tags: Deification, impermanence, Mount Athos, prayer and fasting, Stavronikita Monastery, theosis, Transfiguration | Permalink. Thank you Kostas for letting the light shine through you in this blog. Our Scottish Presbyerian tradition has no honoured place for the Transfiguration, and certainly has nothing to do with theosis! Being transformed into the likeness of God, don’t push your luck, just be glad you’re saved from Hell! So the positive spirituality of your piece is very encouraging to me and to my tradition. In have always liked Raphael’s Transfiguration in which the light from the transfigured Christ shine down on to the face of the epileptic boy in the lower section of the painting. Your words reminded me of the great painting.